Ixion Models: Photos - Low Frame 32 Class First EP! Photos - Low Frame 32 Class First EP! As promised yesterday, here are the first photos of the first EP of Ixion's NSWGR low frame 32 Class. REMEMBER - the EP is a first trial build of the components to assess fit, accuracy, compatibility and running qualities at this stage of the production process. This model has been pulled apart to examine wiring, connections, and mechanism. Some parts are not glued in, and some details are not yet present. A number of mould surfaces have not yet been polished, so the tell-tale "spiral" patterns of the toolmaking machines are present on the surface. Before each photo, I have made comments about some of the issues already identified with the EP. However, (as indicated yesterday) I am posting this from my hospital bed, so if I forget some of what Phil has told me please allow me some leeway! As with the CAD drawings posted earlier in the year, Ixion invites your email feedback to info@ixionmodels.com. In particular, we are looking for what could be designated 'obvious errors', remembering that all models contain necessary production compromises. Even if you are just as excited as we are that the model has reached this stage, and would like to share your enthusiasm, we'd love to hear from you. And if you'd like to save $50 by purchasing a loco at the pre-release price of $545 (post free), visit our website here to see the available variations, or scroll further down this page. Curved running board, original P Class 6 wheel tender. Note the beautifully fine RP88 wheels, and the PCB for the operating LED inside the headlight. 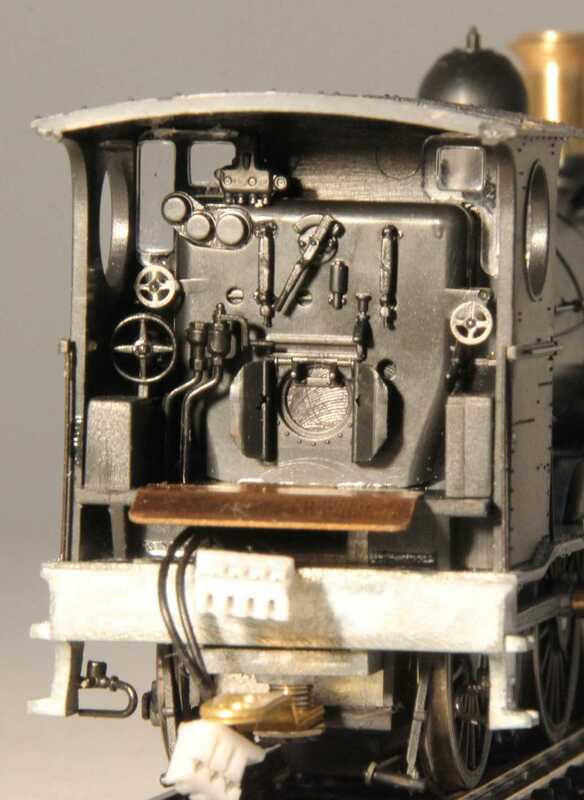 The removable piece in the front buffer beam for fitting a front end Kadee can be clearly seen; the buffers are sprung. The join in the chimney is commendably flush, and the cutout in the front of the cylinder to permit traversing of 18" (45cm) radius curves is unobtrusive. The loco will be supplied with a piece to glue into this space to correct the compromise for modellers with larger radius curves. The loco boiler is a bit crooked - it was not quite re-seated properly after being disassembled. The running plate also slightly bowed - it came from the factory thus, and is not a production model feature! Some of the pipework is loose on the boiler and is not seated in the appropriate brackets. The generator on the firebox should have a vertical exhaust pipe - shouldn't it? We are checking the angle of the cylinders - it looks slightly off. The P Class tender has been shared with Ixion by Shrike Models, from their 30T loco. (In return, a modified version of our C32 bogie tender is the one which will be available on the Shrike loco.) Note that the fitting of a Kadee No.5 coupler is the Shrike specification - all Ixion locos will be supplied with the Kadee No.58 'scale' coupler as seen fitted to the bogie tender below. The bow in the running plate is evident in this shot, as is the 'lean' of the boiler. Sorry about that. Curved running board, 3650 gallon T Class tender. Even as an EP, I love this picture. It looks like a low-frame 32 to me! This is the same loco body as above, now with the bogie tender, so all the comments above apply. We are delighted with the fine vertical handrail on the far side of the front buffer beam. The rear view showing the scale #58 coupler. Again, we are very pleased with the fineness of the detail additions, in this case the brass fire iron brackets on the far side of the tender top. The cab interior., showing the mechanical and electrical connections. This not my area of expertise, but I think the copper fall plate should be wider than that! The water glass looks a little to the left of where it should be, one of the wheels on the left Phil described as "an impression" - please email if you can see the issue. The circular moulding 'sink hole' to the left of the RH cab window will not be on the finished model, and nor will all those spiral grooves where the mould surface has not yet been polished. An etched brass piece was supplied which will be fitted to the back edge of the cab roof which will complete the prototypical appearance, but we didn't want to glue it on, and thought it would have looked poor if we just blu-tacked it in place! At this point, we expect the cab interior on all locos will be painted light green from the floor to point halfway up, as it is on the preserved 3265 (which, incidentally, is the loco that this variation represents). We would be glad of photographic evidence which would support any other scheme in the regular "in service" black C32s represented by our other models. Thanks all, for looking. I'd be pleased to hear your feedback.